In case it wasn’t obvious, this has been a rough month at work. Lots of late nights and scrambling to get things in order and it looks likely to continue through mid-March/early-April. Look at all the wild colors! Never got around to posting this last Wednesday. Still, may be the last time in a while I see 170s on the scale, so worth posting. Also, ran a 5K in sand this weekend. Didn’t feel too bad at first, but I definitely felt it in my lower legs on the second half. 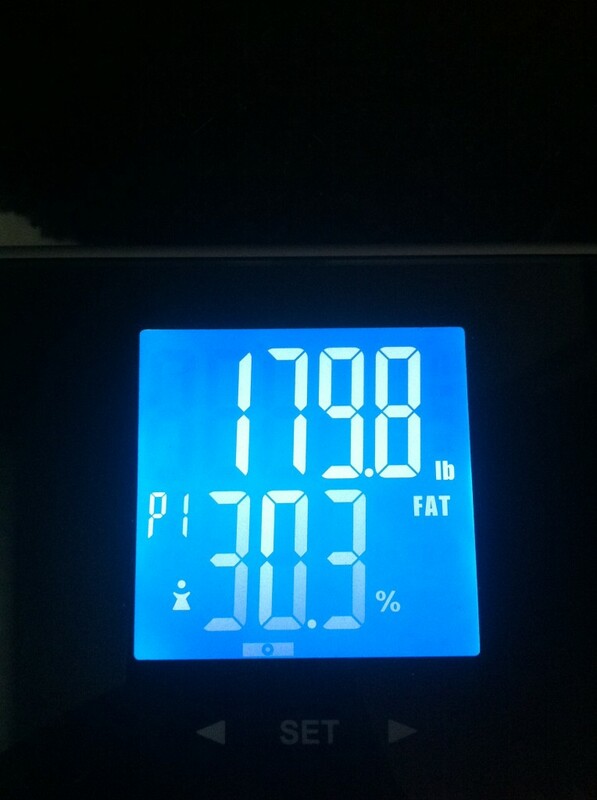 February 5, 2014 – Broke the 180s, for about a minute. This is FOR REAL — The Palo Alto Public Library is offering classes on brewing! Libraries are important cultural and learning centers, folks. Members of the community can show up and without paying for private classes talk with librarians who will point them in the direction of learning materials, help organize talks and discussions, and generally assist in access to information. Go buy a librarian a beer, everyone! One thing that puzzled me in the article was the class title, “The Techie Side of Beer.” At Stanford, there was a common debate about whether things were “fuzzie” (humanities) or “techie” (sciences) and where one placed oneself on the continuum. We even had to read a book about it the summer before my freshman year at Stanford, so that we could all sit around in sharing circles (I mean in dorm lounges) and talk about what it felt like to be considering a humanities major at a university that was massively invested in engineering. As cynical as the above may sound, I loved Stanford, and was never made to feel unwanted or unsupported for my interests in, say, Classics. The Classics Department newsletter is probably the one publication from Stanford I receive that I read cover to cover. My 10th year anniversary is coming up and I’m considering attending. Doesn’t hurt that a trip out to the Bay Area sounds like a nice vacation now that I live in the Midwest. Problem is that many of my college friends are spread in a 2-year band on either side of me, so I would have had as many people I wanted to see at the 2003 Reunion as I would at the 2004 Reunion. The plus side is burritos…and sushi…and micro greens…and the sunset over the Pacific Ocean. At least it’s sunny here in Columbus today. It makes me miss the Bay Area less when I can see the sun. So, should I go to Reunion? Back to beer: I’m going to go out on a limb and say that most of beer is a “techie” pursuit, in that brewing beer involves knowledge of chemistry and strict attention to procedure. Drinking beer involves hedonistic pleasures that could be considered more fuzzie, but if it’s a class on brewing, I would think the technical elements would be emphasized. I continue to be astounded that there is such a thing as the public library. Having a safe, well-lit, inviting place where anyone in the community can go to read and relax is, quite possibly, the best expression of what makes civic life in America great. It makes me sad to think that there are communities out there that aren’t able to maintain their public libraries. When we lived in San Francisco, we briefly belonged to a private library, which was convenient to where we lived and ran all sorts of film nights and lectures. But, it also served to insulate its members from the substantial homeless population of the City. In hindsight, while I don’t regret joining the Mechanic’s Institute in SF, I’m glad to be able to go to the Columbus Main Library for nothing more than the costs of my taxes. And I am fine with people who pay no taxes at all (children, those who make too little to pay) using the space as a clean, warm, comfortable place to spend their afternoons. And while I don’t like the idea of people using the computers to look at adult websites, I’m proud of Columbus for respecting the right of users to make those decisions for themselves. Books. For FREE. One more reason why I wouldn’t want to live any other time in history.